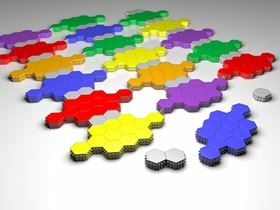 Schematic illustration of nanoporous graphene. Scanning tunneling microscope image and nanoporous graphene template structure overlaid. 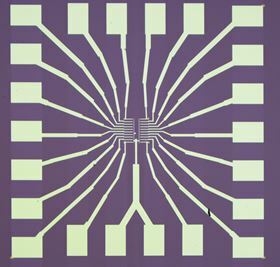 Optical image of proof-of-concept nanoporous graphene FETs. Perforating graphene with tiny holes has a profound effect on this remarkable material. Pores not only transform the semi-metallic material into a semiconductor but also turn graphene from the most impermeable of single-layer thin films into the most efficient filter. But producing porous graphene is no easy task. Now, however, researchers have devised a means of synthesizing porous graphene with great precision [Moreno et al., Science 360 (2018) 199]. The team from the Catalan Institute of Nanoscience and Nanotechnology, Consejo Superior de Investigaciones Cientificas, The Barcelona Institute of Science and Technology, Universidade de Santiago de Compostela, Donostia Internationale Physics Center, Ikerbasque, and ICREA-Institucio Catalana de Recerca combined in-solution chemistry with on-surface synthesis to create the nanoporous graphene. “We used a bottom-up, on-surface approach starting from organic molecules and show that the final material shows higher quality compared to nanoporous graphene obtained by alternative topdown approaches. The quality of the material is crucial to the use of nanoporous graphene membranes as smart filters and sensors,” says César Moreno, first author of the study. The key aspect of the synthesis is that a simple three-stage process creates ordered arrays of pores separated by ribbons, which can be tuned down to the 1-nm range. First, graphene nanoribbons are synthesized using a well-recognized method. The nanoribbons are then joined together laterally using a highly reproducible and selective cross-coupling reaction. This step relies on a carefully designed precursor that defines the edge of the nanoribbons and guarantees a high yield. The catalyst surface, which in this case is Au(111), was also chosen carefully to provide the necessary level of control. 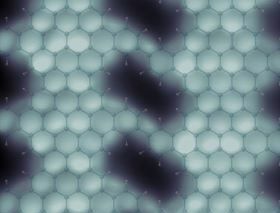 The first heating stage polymerizes the starting molecules into linear chains; the second, at a slightly higher temperature, creates flat graphene nanoribbons from the aligned polymer chains; and the third heating stage, at a higher temperature once again, fuses the ribbons into nanoporous graphene sheets. The sheets produced by this method can be as large as 50 nm × 70 nm with a uniform array of pores 0.4 nm × 0.9 nm at a very high concentration (480 × 103 pores per m2). This unique structure confers a band gap, one-dimensional anisotropy, and localized electron states that can be harnesses for transport or sensing. Once transferred onto dielectric substrates, this versatile, multifunctional material could find a variety of uses, believe the researchers, from field-effect transistors for flexible, transparent electronics, optoelectronics, or separation membranes for water desalination, pollution treatment, or gas separation. Moreover, the atomically precise shape and nanometer scale of the pores, combined with the total impermeability of graphene, makes this material a highly selective molecular sieve, adds Moreno. “The selectivity can be enhanced by controlling the pore functionalization, which can be achieved by modifying the precursors,” he explains. This feature could enable more unique applications, such as sensing, sieving, or even electrical DNA sequencing. This article was originally published in Nano Today 21 (2018) 7-8. Holey graphene for more efficient hydrogen production with cheaper metals.